Montego Bay is a fun destination that provides an ample amount of activities to choose from. From horseback rides down the beach, to water sports, shopping and pristine beaches, you can find something for everyone. At Yellowbird Villa, you are just a short drive to all these adventures while being conveniently nestled in a relaxing world all of your own. With four bedrooms and baths, you can easily share this magnificent home with family and friends and enjoy making some fun, lasting memories. The cool island decor and large airy rooms are a breath of fresh air. The terrace has a lovely sitting area with a couch and chairs for enjoying afternoon chats, playing some fun board games or just enjoying the local flora all around. Nearby, the verandah has a wooden slated roof with tropical greenery growing up and over the top with a dining table set for eight allowing you to enjoy a magical morning breakfast out in the cool, fresh ocean air. Just a few steps away is the oversized pool and wraparound deck with plenty of lounge chairs. There is also a small green courtyard perfect for outdoor play. The property comes with two golf carts, providing easy access to the beaches and amenities of the Tryall Club just a short drive away. Magnificent Views on Barnes Hill! Yellowbird Villa is a beautifully appointed four bedroom island home. 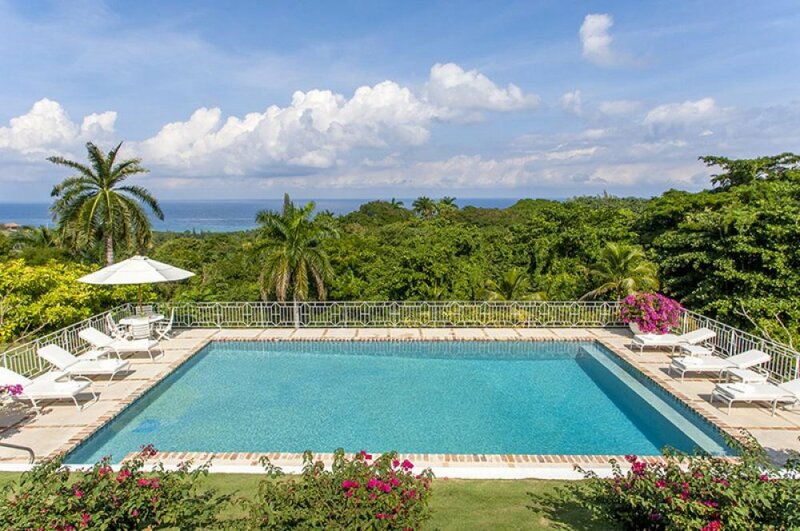 Completed in 1991, this lovely villa offers spectacular views of the Tryall Club’s golf course and the Caribbean Sea. Modern furnishings, tile floors, dark-wood trims and shutters give the feeling of old world charm and easy elegance. The spacious living room with built-in bar also features cable television and a VCR. It extends its lovely ambience to a covered verandah, perfect for entertaining on mild Caribbean evenings. There is a dining room for more formal occasions, as well as patio with dining area that can set the sunny scene for a delicious breakfast or brunch. The oversized pool and deck are beautifully bordered by gardens bursting with tropical flowers. With four air-conditioned bedrooms there’s plenty of room for everyone at Yellowbird Villa. The master bedroom has two queen-sized beds, cable television and ensuite bathroom with separate dressing area. The two guest bedrooms have two twin beds and enjoy their own private ensuite bathroom. The final guest bedroom has two double beds as well as an ensuite bathroom. Yellowbird Villa provides two complimentary golf carts, and the welcoming villa staff is comprised of a superb team of a cook, two housekeepers, laundress and gardener.